HackYourPhD US. The Open Knowledge Conference and afterwards? The Open Knowledge Foundation is a major organization in the world of “Open”. The OKFN started in 2000 in the UK. OK France was created last December. It is now an international network that is currently being developed. The OKFN has an important role in the facilitation of projects related to the opening of knowledge and data. It is coordinating them and is also providing technical and legal support. Last year, Helsinki had been chosen to host the Open Knowledge Festival. 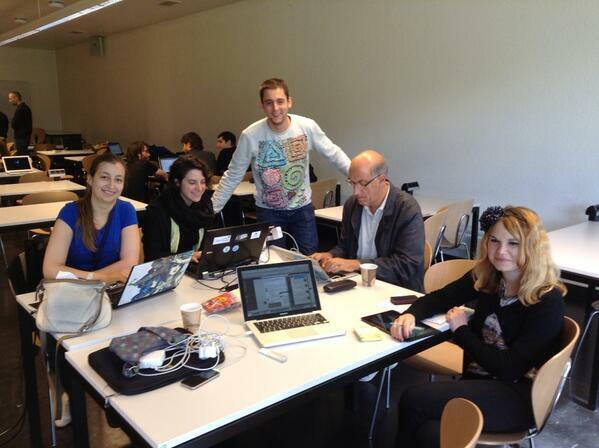 The Geneva Open knowledge Conference was the second meeting of this foundation. One day of pre-conference, so that we can get our bearings and let Switzerland introduce her new Open Data platform. Two days of conference: Open Data was the main topic but other sessions about various topics of the Open were organized: particularly on Education, Culture and Technologies but also on Science and Research… Open Science was not to be outdone, with two presentations in the main lecture theatre. The third day saw a variety of workshops. It is worth mentioning that HackYourPhD took part to the organization of the Wikisprint of the Open Science and Citizen Science workshop. A wikisprint aims at aggregating content on wikipages within definite limits in a collaborative way. Communication of scientific results to the public. John Ellis, one of CERN’s researchers, gave us a most educative presentation of the famous Higgs boson! Interaction between Science and Society: projects of the Cyberscience Center and Crowdcrafting platforms play a major role in the projects of citizen science. Collaborations and Open research practices were also largely represented. Open Acess is something that seems relatively normal for them. Researchers are starting a new phase: Open Hardware, i.e. open-source of plans, codes, etc., to create, among other things, electronic material. Javier Serrano talked about it at great length during the session dedicated to this particular topic (summary of the talks) and allowed me to interview him. Open Science: Where are we going? This conference was also the opportunity to see where we are today in the coordination of the Open Science initiatives. Organizations such as Mozilla Science Lab are making the first moves for coordinating the software and tools being developed for Open Science. But what else can we build? It is difficult to come good with wider actions about Open Science. The stakeholders sometimes have a different view regarding what it represents. Anyway, I think it is necessary to understand the different views and how this movement can be characterized. The organization of a wikisprint on the fourth day of the conference was a step in this direction. On Thursday 19th September, in the presence of the P2P Foundation and Wikipedia, twenty people in France, Switzerland and in other locations took part in this event. Here is a little souvenir from our team in Geneva. This meeting shows that there are some people who are willing to understand Open Science and the practices behind this concept. Coordination of Open Science initiatives. Training and communication specifically for researchers but also for the wider public about these new research practices. I shall develop about these three areas later on. They are perspectives that I would like to explore gradually. The trip gave way to several questions but also allowed me to set up tracks. The objective is, now we need to build the road to get there. As usual, it will be done by use of iterations and by trial and error. It is at times rather exciting to know that we can experiment and try. But it is also worrying to try to invent a future that is a bit different. Anyway, whatever the outcome, we can expect great encounters and experimentation!